MO MGMA monitors current industry, legislative, and regulatory issues and provides periodic updates, articles and information from consumer, trade and MGMA publications and resources to help you and your physicians keep pace with the dynamic healthcare environment. Visit MGMA to review current topics. With national legislative and regulatory issues constantly before our Congressional Leaders, it is critical that medical practice executives know their elected officials. 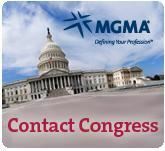 Access the MGMA Legislative Action Center.